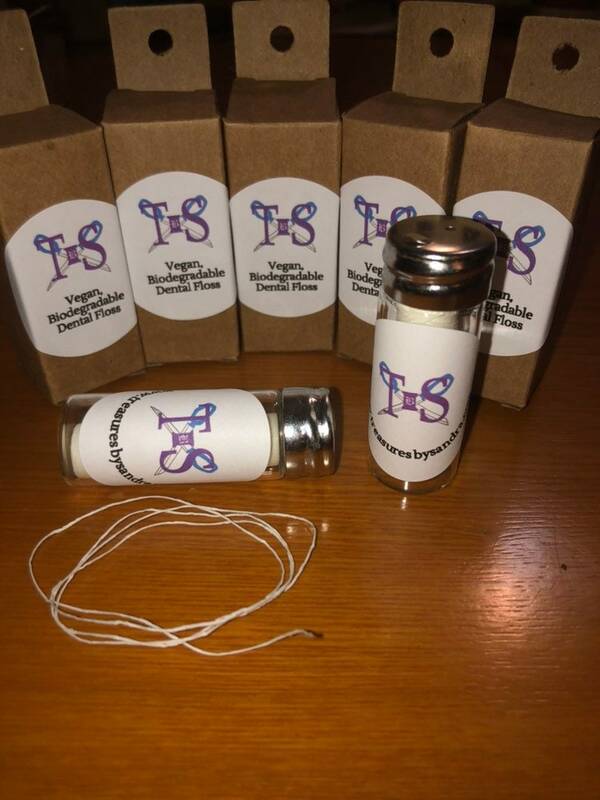 Treasures By Sandra – The Blog – One woman's journey to starting her own business. One woman's journey to starting her own business. Welcome! If you are reading this I give you fair warning that this is my very first attempt at a blog. The purpose of this site is to document my journey on a major life change, which I will describe in further detail below. I will be writing about my vision, purpose, goals, achievements and failures. I must admit that it is a bit nerve-wracking to be putting all of this out in a public forum, but nothing gets accomplished without an element of risk, right? A little bit about myself: I am a middle-aged woman with two boys , 9 and 6, a husband, a dog, and a cat. I have a master’s degree in archaeology, and work full-time as a consultant archaeologist. More than full-time, actually, which is one of the reasons I am embarking on this journey. Well, that and there is small chance I may be having a midlife crisis (half-joking!). Archaeology is really my first love. Not in the sense that I love it more than my wonderful family, but in the sense that I found archaeology before I met the man who would become my husband. I tailored my entire life around this semi-nomadic profession, and committed myself to if fully. Archaeology will always be a part of my life, no matter where the rest of my life takes me. But here is the rub – I currently work two jobs. One was full time until a few months ago. I work for an international engineering and design firm, and was happy as a clam in this job for years. Then things changed abruptly and work really slowed down. I was demoted to part time status. This is a problem for a family of four living in California! I was very fortunate in that I immediately began picking up other work with a very small local company. My new boss is amazing, I love the work I am doing there, while the first job has become a soul-crushing experience. And the result of having two part-time jobs is that I am working far more than 40 hours per week. This is not sustainable. For my health, my sanity, and for my family. Unfortunately, the new job is a very small company, and cannot yet have me on full time – though this is the ultimate goal. My goal: to start my own home-crafting business to replace the income I would lose by quitting Job #1, while allowing me to keep working for Job #2. Is this plausible? I have no idea. I have some great role models within my circle of friends who have home-based businesses and blogs, so I know it is possible. The question is: do I have what it takes? I guess we will find out. 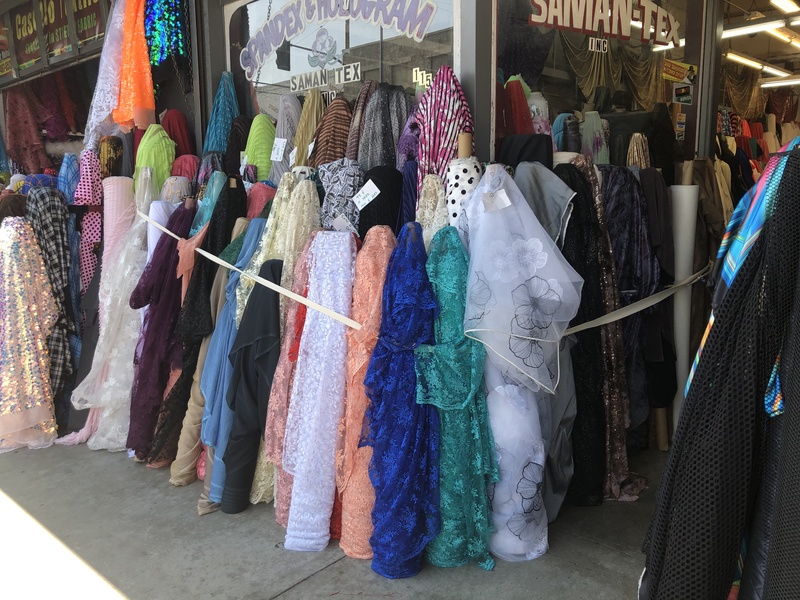 So…If you live in southern California and are in any way into sewing, costuming, or really anything involving fabric you have undoubtedly heard about the garment district in Los Angeles. It has the largest collection of fabric vendors in the United States – in about a 5-block area. This place also has the best prices on fabric north of the Mexican border. I have ALWAYS wanted to go there, but have never had a project big enough to warrant the 2+ hour drive, insane traffic, and a full day away from my family. This weekend was THE weekend. Accompanied by my friend Debbie, I made the trek to La La Land. It was like a pilgrimage. I was certainly not disappointed. The sidewalks were full of rolls of fabric spilling from over crowded shops. The flashiest fabrics are put outside so that their sequins and sparkles can catch the sunlight, and it creates quite a spectacle! Add to that the endless array of street food vendors and hundreds of shoppers and the situation can quickly become overwhelming – especially for a small town girl, like me. The food vendors are an interesting mix. There are the typical hot dog vendors and taco carts, but there is also a wonderful array of cut up fruit and vegetables with south-of-the-border seasonings (Tajine, anyone?). I longed to buy a cup full of papaya spears, or munch on spiced watermelon, but I had my mind set on a goal: To find the elusive birds-eye cotton or flour sack cloth. I had been searching for these two items online and in every local fabric shop I could find, with no luck. Since I had the luxury of the company of a seasoned Fashion District professional seamstress and costumer, I let Debbie lead the way. She had previously given me several pointers: 1) bring cash, 2) take the full day, and 3) be prepared to haggle. With my walking shoes on we set out from the car park and braved the chaos. After rummaging through the backs of six or seven shops with absolutely no luck I was beginning to lose hope. Some of the shops were starting to close up, and I was getting a little nervous. Then I hit the jackpot! One small, well kept shop. Cleaner than the rest, with a very nice Isreali fellow who had a kind look to him. I explained what I was looking for, and what I was planning to make out of it. He replied that he did not have anything like I was describing, but he did have a great selection of linen fabrics that would work very well. We went to the back of the store where there were rolls and rolls of fabric stacked in a corner. Most of it linen. In wonderful patterns. In wonderful colors. I felt like I had found the promised land! In total I purchased nearly 30 yards of linen in three different colors for $150. Thrilled with my purchase, but still not giving up on my quest, we kept going. We stopped by another nearby shop. The shopkeeper was standing on the sidewalk and asked if he could help us. I explained my case and he replied sadly that he didn’t think he had anything suitable. Debbie had gotten lost in a section of embroidered cotton lace and was dreaming of the costumes she could make with it, so I started wandering to the back of the shop. The Fashion District is where designers go to find unique fabrics and notions. Because of this, most stores focus on glitzy showy things that might look good on the red carpet. Not too many shops really had any ‘utility fabrics’ like I was hunting for. But, in the dimmly-lit back of this shop were rolls upon rolls of plain cottons. After nearly 15 minutes of hunting in this area I found it. A large roll of birdseye cotton. Not pure cotton like I was hoping for, but a cotton/poly blend. The shop keeper cut off a patch for me to play with, and I tested it’s absorbancy. It was perfect. The 60-inch tall roll cumbersome, but we managed to get it out from it’s pile and down to a fabric roller. He asked how much I wanted. It was $3 per yard. My reply: “How much do you have?”. So I bought it. The whole roll. 35 yards of it. Our next mission – how do we get this to the car??!! We had nearly 70 lbs of fabric, half of it on a 60-inch tall roll. I managed to get the roll up on my shoulder, purse on the other shoulder and bags of linen in the other hand. Debbie carried some too, and also had her own things to carry. She walked behind me to make sure I didn’t take anyone out on the sidewalk during our four block trek back to the car. Fun Day, great company, mission accomplished. Can I ask for more? Now, you may be wondering what I am going to do with this bounty of woven wonders. Oh, I have plans. Many, many plans. But this is a blog post for another time. Send me a note if you have any requests for products. I am in research and design mode for the next couple of weeks and would love to tackle a new design for someone. Also, there are new items up in my Etsy shop! My new, homemade Lucious Lemon and Alluring Anise flavors are up for sale and there will be many more flavors to follow. Check it out! Etsy: TreasuresbysandraUS.